I currently support many of the active state QSO party contests as listed below. I've only skipped (or dropped) support for contests where a few logs were submitted, contest sponsors have been unresponsive to my e-mail, contest sponsors frequently change their rules or the rules structure is such that the coding time required is prohibitive. The state QSO parties have wound up requiring far more support time than I originally anticipated due to frequent rule changes. If a contest sponsor frequently changes rules, or alters the rules so that the contest becomes difficult to support with an existing template, I will not be able to continue to support that QSO party. In short, if you don't see the state QSO party your are looking for on this list, I don't currently support it, even if I had supported it in the past. You'll find all the registration information at the bottom of this page. Download 7QP In Region QSO Party Log 3.0 Now! Download 7QP Out of Region QSO Party Log 3.0 Now! Download Alabama In State QSO Party Log 1.8 Now! Download Alabama Out of State QSO Party Log 1.8 Now! Download Arizona In State QSO Party Log 2.2 Now! Download Arizona Out of State QSO Party Log 2.0 Now! Download Arkansas In State QSO Party Log 2.1 Now! Download Arkansas Out of State QSO Party Log 2.1 Now! Download British Columbia In Province QSO Party Log 1.9 Now! Download British Columbia Out of Province QSO Party Log 1.9 Now! Download California In State QSO Party Log 4.1 Now! Download California Out of State QSO Party Log 4.1 Now! Download Colorado In State QSO Party Log 1.9 Now! Download Colorado Out of State QSO Party Log 1.9 Now! Download Florida In State QSO Party Log 4.1 Now! Download Florida Out of State QSO Party Log 4.1 Now! Download Georgia In State QSO Party Log 4.0 Now! Download Georgia Out of State QSO Party Log 4.0 Now! Please note that the rules for the Georgia contest consider CW and Digital modes duplicates. Therefore, for proper dupe checking, if you wish to run digital, you'll need to select CW mode for your digital contacts and then edit each of those contacts after the contest. Download Hawaii In State QSO Party Log 1.3 Now! Download Hawaii Out of State QSO Party Log 1.3 Now! Download Idaho In State QSO Party Log 1.9 Now! Download Idaho Out of State QSO Party Log 1.9 Now! Download Illinois In State QSO Party Log 4.0 Now! Download Illinois Out of State QSO Party Log 4.0 Now! Download Indiana In State QSO Party Log 4.0 Now! Download Indiana Out of State QSO Party Log 4.0 Now! Download Iowa In State QSO Party Log 2.0 Now! Download Iowa Out of State QSO Party Log 2.0 Now! Download Kansas In State QSO Party Log 1.7 Now! Download Kansas Out of State QSO Party Log 1.7 Now! Download Kentucky In State QSO Party Log 1.9 Now! Download Kentucky Out of State QSO Party Log 1.9 Now! Download Louisiana In State QSO Party Log 1.7 Now! Download Louisiana Out of State QSO Party Log 1.7 Now! Please note that the rules for the Louisiana contest consider CW and Digital modes duplicates. Therefore, for proper dupe checking, if you wish to run digital, you'll need to select CW mode for your digital contacts and then edit each of those contacts after the contest, changing the mode to DIG on the edit form. Download Maine In State QSO Party Log 1.9 Now! Download Maine Out of State QSO Party Log 2.0 Now! Please note that Maine out of state stations can work anyone, not just Maine stations, so the out of state form for Maine is a bit different than the other out of state programs. Download Maryland In State QSO Party Log 4.0 Now! 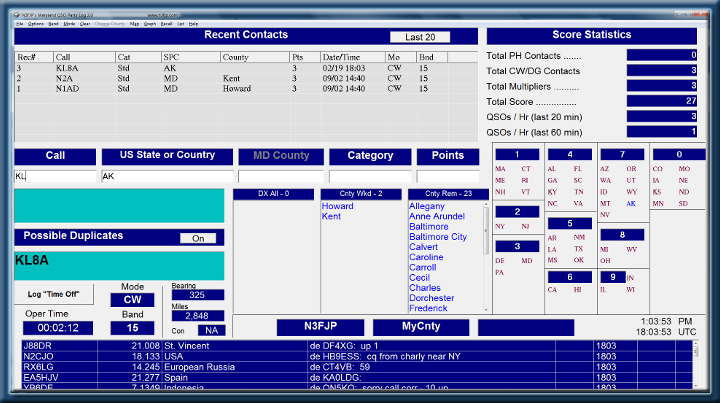 Download Maryland Out of State QSO Party Log 4.0 Now! Download Michigan In State QSO Party Log 4.1 Now! Download Michigan Out of State QSO Party Log 4.0 Now! Download Minnesota In State QSO Party Log 3.0 Now! Download Minnesota Out of State QSO Party Log 3.0 Now! Download Mississippi In State QSO Party Log 3.0 Now! Download Mississippi Out of State QSO Party Log 3.0 Now! Download Missouri In State QSO Party Log 1.7 Now! Download Missouri Out of State QSO Party Log 1.7 Now! Download Montana In State QSO Party Log 1.7 Now! Download Montana Out of State QSO Party Log 1.7 Now! Download Nebraska In State QSO Party Log 4.0 Now! Download Nebraska Out of State QSO Party Log 4.0 Now! Download New England In Region QSO Party Log 4.0 Now! Download New England Out of Region QSO Party Log 4.0 Now! Download New Jersey In State QSO Party Log 2.1 Now! Download New Jersey Out of State QSO Party Log 2.1 Now! Download New Mexico In State QSO Party Log 1.8 Now! Download New Mexico Out of State QSO Party Log 1.7 Now! Download New York In State QSO Party Log 1.9 Now! Download New York Out of State QSO Party Log 1.9 Now! Download North Carolina In State QSO Party Log 3.0 Now! Download North Carolina Out of State QSO Party Log 3.0 Now! Download North Dakota In State QSO Party Log 1.7 Now! Download North Dakota Out of State QSO Party Log 1.7 Now! Download Ohio In State QSO Party Log 4.2 Now! Download Ohio Out of State QSO Party Log 4.1 Now! Download Oklahoma In State QSO Party Log 4.0 Now! Download Oklahoma Out of State QSO Party Log 4.0 Now! Download Ontario In Province QSO Party Log 1.8 Now! Download Ontario Out of Province QSO Party Log 1.8 Now! Ontario rovers, please note, if you are in Ontario, operating as a rover, you will be able to work the same stations from the new county, but multipliers are only added once per band, not once per band per county, so your final score will have to be calculated by the log checking software when you submit your Cabrillo file. Download Pennsylvania In State QSO Party Log 4.5 Now! Download Pennsylvania Out of State QSO Party Log 4.3 Now! Download South Carolina In State QSO Party Log 2.3 Now! Download South Carolina Out of State QSO Party Log 2.3 Now! Download South Dakota In State QSO Party Log 1.9 Now! Download South Dakota Out of State QSO Party Log 1.9 Now! Download Tennessee In State QSO Party Log 2.0 Now! Download Tennessee Out of State QSO Party Log 1.9 Now! Download Texas In State QSO Party Log 4.1 Now! Download Texas Out of State QSO Party Log 4.1 Now! Download Vermont In State QSO Party Log 1.5 Now! Download Vermont Out of State QSO Party Log 1.3 Now! Please note that the club station bonus multipliers are not calculated by the software, but they will be added by the contest scoring robot on submission. Download Virginia In State QSO Party Log 3.0 Now! Download Virginia Out of State QSO Party Log 3.0 Now! Download Washington Salmon Run In State QSO Party Log 4.0 Now! Download Washington Salmon Run Out of State QSO Party Log 4.0 Now! Download West Virginia In State QSO Party Log 4.0 Now! Download West Virginia Out of State QSO Party Log 4.0 Now! Download Wisconsin In State QSO Party Log 4.2 Now! Download Wisconsin Out of State QSO Party Log 4.2 Now! Very easy and intuitive to use! Writes Cabrillo file (or other as contest rules dictate) for log submission. Provides many current statistics and visual displays. Exports ADIF files for easy transfer to your permanent log. Computer generated CW via either your serial port (including RTS or DTR com line options ) or Winkeyer and play wave files via your sound card. Interfaces with many digital programs and other software via API including Fldigi, JTAlert, PSK Express and more! Fully networkable! You can have as many PCs updating the same log file simultaneously as your LAN will support..
Click here for a revision history of these programs. The State QSO Party logs are limited to 30 contacts until registered. For permanent use of each state qso party program, a $8.99 registration fee is required. All the State QSO Party Logs are included in our software package! Register all of our logging software at once and save hundreds with the N3FJP Software Package! Please see the Register Now! page for details! To purchase by credit card via PayPal, please click an icon below. Please be sure to include your call sign and which State QSO Party Log you would like to register with your order by clicking "Add" for Special instructions to the seller on the PayPal order form in the Shipping address section. This option is a great deal and your best value! To register all the programs individually would cost over $400.00! For more details, click here! N3FJP Software Package & CD (shipping/handling included) includes full registration of all my amateur radio software (more than one hundred programs in all) on a CD, free registration of any additional amateur radio software that I add to the package, as well as free upgrades to existing programs. This option is a great deal! To register all the programs individually would cost over $400.00! For more details, click here!